We all have that one herb we can't grow enough of and for me that herb is lavender. No matter how many lavender plants I have, I just can't get enough of these fragrant purple flowers! I have been growing lavender for several years and by far my favorite variety is English Lavender (Lavandula angustifolia) I love it so much that I even grow lavender right beside the kitchen door! I use lavender in many different ways including lotions, salves, teas and even baked goods. I mostly use lavender for it's aromatherapy properties. It's known to help induce sleep, calm anxiety, reduce stress and soothe headaches. English lavender (also known as true lavender) is a small evergreen shrub and is the most aromatic variety of the lavenders. It is pest resistant and a low maintenance herb. It's fairly easy to grow, but can be difficult to get started from seed. Many people choose to propagate lavender from cuttings instead as it is much easier. When deciding where to plant lavender, choose a roomy location. Lavender likes it's space, so make sure plants are at least 12-18" apart. Lavender requires good air circulation, so make sure it's not surrounded too closely on all sides. 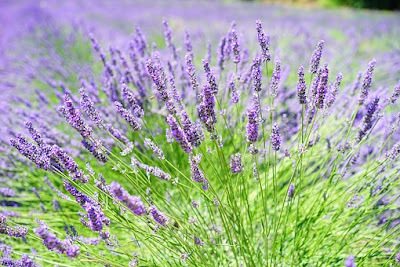 Also, lavender does not liked to be moved so make sure you chose it's permanent home when you plant it the first time...it probably won't tolerate a move after becoming established. Lavender likes a full sun location with slightly alkaline soil. Choose a well drained location. I have mine at the top of a slope which aids in drainage. You can also add contractors sand to the soil to increase drainage. Lavender likes bone meal, so add some to the soil when planting to help with growth. I also dust a little bit of wood ash around the bottom on my plants about once a year. Do not mulch with wood chips. Instead use something light like crushed shell or a thin layer of sand. A light pruning in early spring will promote branching. Only water lavender when the soil is dry to the touch. Lavender dislikes being wet, but don't let it get so dry that it starts to wilt. Lavender is difficult to start from seed. I try every year and only get a few plants out of the dozen seeds I start. Even the seedlings need well drained soil and will fail if allowed to stay wet for too long. You might want to save yourself the hassle and just buy a started lavender plant at the nursery. Remove the leaves on the bottom half of the stem. Dust with cinnamon to encourage rooting. Place the cutting in potting soil and tamp the soil down with your hands to keep the cutting from falling over. Keep the soil damp for about 2 weeks, then start to let it dry out between watering. When you start see new growth you can move it to a bigger pot or plant it in the ground. Lavender grows for about 6 years before getting too scraggly and needing replaced. Sometimes you can revive it with a drastic pruning though, so if your lavender plant starts to get old you might as well give it a try. Now that you're growing your very own lavender plants,check out the post I wrote about How to Harvest and Dry Lavender. Head over there and learn how to preserve and use your lavender! THANKS for the great info to grow lavender....I was wondering if you have any suggestions for growing lavender in POTS..?? Sure. Lavender can do very well in pots if you don't give it too much room. It sounds odd, but they like to be a little cramped, so when repotting choose a pot only about 2" bigger then the current one. Add some sand or dolomite to the potting mix. Make sure there are lots of drainage holes, lavender likes to dry out between watering so drainage is a must. Also, place your pot in an area that gets full sun. Good luck with your lavender! Thanks for the helpful tips. I'll be pinning this one. I absolutely love lavender! I'm going to have to give it a go growing some. Great post! My favourite flower. Thanks for the great tips. I love the look and smell of lavender, but I don't have any growing in my yard. I'm pinning your post so that I can refer to it for planting and maintenance. Thanks! You should definitely grow some! You'll love having it so close by when you need it. I adore lavender! Some day our #yearofno will be over and I'll be able to garden again. Lavender is going on my must have list! Thanks so much for these tips! Unfortunately, I need all the gardening tips I can get! Pinning to share. Thanks for all the tips about growing lavender. I didn't know about the cinnamon. Hmmmm, make sure it has good drainage and try adding a little wood ash to the soil. Your soil PH may be a little low and that should help. Good luck! 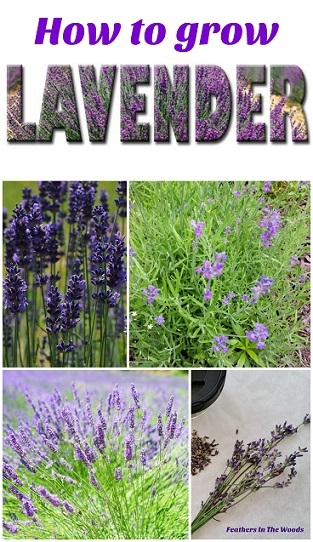 I would love to grow Lavendar! I'll have to start. Thanks for sharing on the #WasteLessWednesday blog hop!